1 Now all the tax collectors and the sinners were coming near Him to listen to Him. 2 Both the Pharisees and the scribes began to grumble, saying, "This man receives sinners and eats with them." 3 So He told them this parable, saying, 4 "What man among you, if he has a hundred sheep and has lost one of them, does not leave the ninety-nine in the open pasture and go after the one which is lost until he finds it? 5 "When he has found it, he lays it on his shoulders, rejoicing. 6 "And when he comes home, he calls together his friends and his neighbors, saying to them, 'Rejoice with me, for I have found my sheep which was lost!' 7 "I tell you that in the same way, there will be more joy in heaven over one sinner who repents than over ninety-nine righteous persons who need no repentance. The Lost Coin 8 "Or what woman, if she has ten silver coins and loses one coin, does not light a lamp and sweep the house and search carefully until she finds it? 9 "When she has found it, she calls together her friends and neighbors, saying, 'Rejoice with me, for I have found the coin which I had lost!' 10 "In the same way, I tell you, there is joy in the presence of the angels of God over one sinner who repents." They came near Him, it says. It is describing something active from their side, an inner urge that drove them – they really wanted to be close to Jesus. Do not read fast through this now, but do stop for what kind of people the Scripture speaks of here: The tax collectors and the sinners! They came near unto Jesus, God’s Son! And not necessarily because it felt good to be near Him, but to listen to Him, it says. So it was something in what He taught them that caused this. It was His message. What did they hear? Yes, it was what springs up in the passage. People may have studied theology for many years and not hear what they heard. It was about them He spoke of, and not as an object for God’s wrath and displeasure, but for God’s grace and love. This was completely new to them. They only knew the Pharisees and the scribe’s godly image, He who hated people like them and in His wrath were going to judge, if there was not any repentance to a moral change. Something they did not find a foundation for in themselves. And this one from heaven sent comes and sits down at their table, and eats with them! Is this God? And is this God’s attitude to us? This was incomprehensible both for them and the Pharisees and the scribes. But listen to what the Pharisees and the scribes testify about Him – even though they grumble about it, they still testify truly in this case: “This man receives sinners and eats with them.”(v.2). They therefore preached about God with character from the devil, and they who gave in to this god/doctrine, received also him as a father, which means, they became the children of lies as the Scripture expresses it. And the unpleasant fruit from this doctrine Jesus reveals when He says to them: “But because I speak the truth, you do not believe Me.” (John 8:45). In other words they were not capable to hear the truth that “I have not come to call the righteous to repentance, but the sinners,” and this repentance consisted of being turned to God by grace in Him He sent out. They grumbled at this. It was not "fair" that these lousy people would get for nothing, what they had worked for, struggled and sacrificed to achieve, and still had to carry a dissatisfaction and nagging unrest in the deep of their heart. This well hidden bitterness towards God, who exists in every lawful heart, springs forth in an answer from the son who is living at home to his dad: “- and yet you have never given me a young goat, so that I might celebrate with my friends.” (Luk.15:29). Yes, one can speak about being blind, about not knowing your dad: “'Son, you have always been with me, and all that is mine is yours.” (v.31). Just slaughter and eat, if you want! This godly image came from the wrong teachings of the law and it leads the Jews into it: “For those who guide this people are leading them astray; And those who are guided by them are brought to confusion.” (Is. 9:16). These were the real lost ones in Israel. Not those who stood there judged by the law, but those whom everybody considered as saved, because their salvation road and salvation preaching excluded the grace of the Gospel. Not that they did not preach about the grace, but it was not the grace Jesus spoke of, and therefore not really grace, but an imitation after the humans thoughts and common sense. God’s grace is for the lost, and to get a better grip on what it will say, we add – only for them. So, try today, if it has anything to do with you. Just like a father longs for his lost son. The One who left His glory to search in the wilderness. We know something about what it cost Jesus today! The One who searched with “light and lamp” after them – yes searches carefully (v.8), and rejoices greatly when he has found one. And as Jesus so nicely tells us: “there is joy in the presence of the angels of God!” (v.10). Can you see this before you? Or do you belong to those ninety nine who do not need repentance? (v.7b). No, then you cannot imagine this joy in heaven. But it is like this for those who are of the truth too, if of other reasons. One cannot imagine that one can cause any joy in heaven when one looks at oneself, but that the heaven would rather cry. Do not look at yourself now, but rather hear like these tax collectors and sinners in the passage heard. They also heard with astonishment about the Gospel, but His word operated faith in them. He gave them trust, and it really says (and it is His enemies that hardly wanted to say anything good about Him, who has to testify about it): “He receives the sinners!” They saw that! Do you? And “Jesus Christ is the same yesterday and today and forever.” (Heb.13:8). Listen you who struggle so heavily with your Christian life, because you try to “make it” work – Who is so tired of all “prayer teachings”, all “methods,” all “discipleship” that will help you up and going – you are object to a lawful doctrine (false teaching), lawful spirit, and God has no pleasure in anything that you do, but teaches you the Gospel about His Son – He who has completed everything for you. Listen to what Jesus says about the wander from the day he found the lost: “When he has found it, he lays it on his shoulders, rejoicing.” (v.5). “And I will give you rest!” (Matthew 11:28). You will hardly be inactive about this Gospel if you let it saturate you, but the driving power will become different, and will only last as long as you have your eyes aimed on this: For Jesus sake alone – everything! 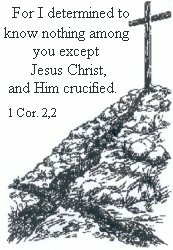 You find God's answer on Golgotha!